As part of our new Tanzania safari options, we work with Nasikia Luxury Camps to offer our clients an affordable Tanzania Safari that includes all the highlights. 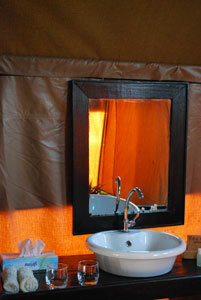 Nasikia Camps are mobile and semi-permanent luxury camps situated in the prime wildlife viewing areas of Tanzania. The tents utilize high quality canvas and have comfortable beds and hot showers, allowing you to experience the sights and sounds of Africa while still enjoying comfortable accommodations. There are 2 camp options, Nasikia Luxury Mobile Camp and Nasikia Central Camp. Inside the tents will be a desk, chair, storage chest (with extra blankets), matting, luggage racks, bedside tables and beds. Travelers can choose from double, single, triple and family tents, each with beds that are fully netted to protect from mosquitoes and insects. Each tent has its own bathroom with running water, a toilet, and a shower. The tents have an extensive solar lighting system as well as a patio area. The camp grounds have a separate lounge tent and dining tent. Chefs prepare delicious bush cuisine using fresh produce from Tanzania. Breakfast is buffet style, lunch at the camp is 2 courses, or a lunchbox for those that will be on game drives, and dinner is 3 courses. Nasikia Luxury Mobile Camp follows the Great Wildebeest migration, as well as other wildlife from the Ngorongoro Conservation Area to the Serengeti National Park. By being mobile, the camps are able to offer the best wildlife viewing. There are 6-12 tents that are 10m by 4m, each with a cooling feature of shade-clothing over the tent. Nasikia Luxury Mobile Camp moves between three locations through the year, except for April and May. From December to March, the camps are in the southern Serengeti and can be reached from Ndutu Airstrip. From June to mid August they are located in the Central-west areas of the Serengeti and can be reached by Seronera Airstrip. From mid August to November the camp is in northern Serengeti and can be reached by Lobo or Kogatende Airstrip. 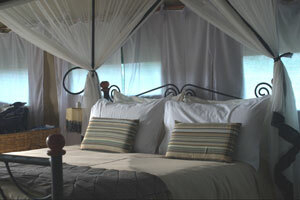 Nasikia Central Camp remains in the central areas of Serengeti National Park. The Central Camp allows for a more economical Tanzania Safari, while still enabling incredible viewing of the wildlife. 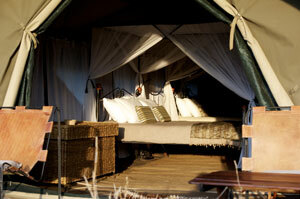 Nasikia Central Camp consists of 10-15 semi-permanent tents, placed depending on seasonality. The location is dictated by the wildlife and several other ecotourism factors. The central camp is in operation from June to late March each year. Located 30 minutes from the camp is Seronera Airstrip, for those who want to fly in or out of the Serengeti. For those driving, getting from Arusha to Nasikia Central Camp takes approximately 7.5 hours. After dinner you can relax around the camp fire and enjoy the music of the Gogo tribe. Just outside your tent, you will find a wide variety of birdlife. As an alternative to game drives Nasikia can arrange Tinga Tinga art lessons, Swahili cooking lessons, or a Serengeti balloon safari. Nasikia Luxury Camps helps to preserve the environment and local culture. People from villages surrounding the Seregneti and Ngorongoro are employed at the camps and advise on the authenticity of the experience, as well as how to minimize the environmental impact of the camps. Income from the camps helps community development projects such as education and employment. Through employment at Nasikia Luxury Camps the community members become active contributors to the preservation of Tanzania’s wildlife, ancient cultures, and environment. Learn more about our luxury Tanzania Safari tours by calling us at (866) 577-2462 to request a free quote!